This distressing condition is rising with the popularity of the breed. As of writing the cause of Vizsla Immune Polymyositis is unknown. 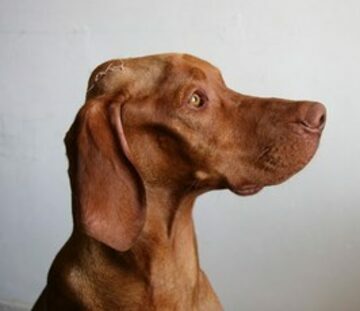 It remains that “the Vizsla” is susceptible to the condition. As breeders we are campaigning for the condition to be researched by the Animal Health Trust. The first symptoms of illness are usually problems with swallowing food and water, excessive drooling, and some muscle wasting around the head. Typical onset is during adolescence or before two years of age and commonly there is an acute episode of retching, gagging, choking, dysphagia and hypersalivation. Sometimes the onset is more difficult to diagnose and characterised by inefficient, messy eating and drinking. Often there is an initial diagnosis of megaoesophagus. Significantly elevated CK levels, fatigue, aspiration pneumonia and a stiffness of gait are other common symptoms. Prompt veterinary attention is necessary. As we have been personally affected by VIP we support the campaign for the condition to be recognised and researched by the Animal Health Trust.